Interested in playing 3 on 3 recreational ball hockey without having to commit to an entire season? Cutting Edge is now offering Adult drop in 3 on 3 ball hockey sessions in Oakville. These sessions are open to adults 19+ of all skill levels interested in playing recreational ball hockey are welcome to attend. Whether you enjoy playing ball hockey or are looking for a great source of exercise 3 on 3 ball hockey is the way to go. If you think you’re a step away from competing for the Stanley Cup this is not the place for you. Why 3 on 3 ball hockey? Remember when you played street hockey as a kid? Did you place the nets 200’ apart? Of course not. Instead, the nets were placed much closer together to create more action and keep everyone in the game at all times. With Cutting Edge’s brand of 3 on 3 ball hockey you don’t need to be a marathon runner to play. Each drop in game is just $10 for 90 minutes. The first 18 players to register for each session will be accepted. 2 goalies are required for each drop in session and goalies are free. Once you have registered a username and password select the buy option in the left hand column followed by packages. Check the box for Adult ball hockey drop in and then click sessions and type in the number of drop in sessions you would like to register for. Press buy and complete the checkout process. Next, click book sessions and scan the calender to find the ball hockey sessions you would like to register for. Select the dates you’re interested in and select book to register. You will receive email confirmation that you’re registered. Cutting Edge’s confined space 3 on 3 ball hockey league allows every player to be in the action at all times, just a few feet from the ball. With an emphasis on quickness, agility and tic tac toe passing plays, a shot on net from anywhere on the rink is always a possibility, forcing goalies to be on their toes at all times. There are no concrete or gym floors here. 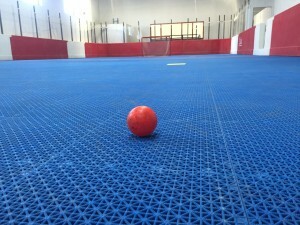 Cutting Edge’s ball hockey facilities are comprised of a professional ball hockey rink complete with flex court sports flooring, plexi glass and netting. Brand new shower facilities have been installed along with 4 dressing rooms, a scoreboard and viewing area for fans.